At its Made by Google event in San Francisco today, Google updated everyone on its Daydream VR plans, officially renaming its mobile VR prototype the Daydream View and announcing it would be released in November for $80. At under 200 grams in weight, the View should be fairly comfortable for the average user considering that it's being made from fabric. 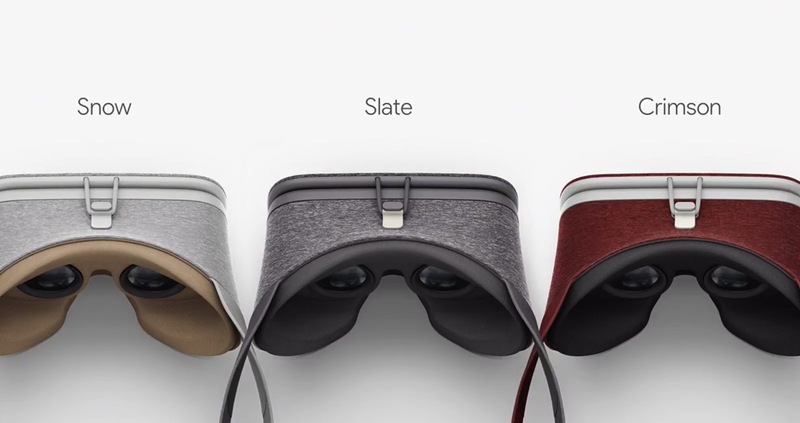 Google said that the View will be compatible with faces that already have eyeglasses on and the device will be made available in three colors: Snow, Slate and Crimson. The View uses a little three-axis remote (similar to the Wii remote) that can be stored in the headset itself, and while Google's new Pixel will be the first phone to support Daydream View, Google said it's looking to get phones from other manufacturers certified for the View as well. Importantly, from a mainstream usability standpoint, Google said that when a phone is placed into the headset an NFC chip automatically senses its presence and launches Daydream; additionally, the headset can detect face position and center the image for a user automatically. In terms of content, Google revealed a game tie-in to Fantastic Beasts and Where to Find Them, a Harry Potter VR experience that should be ready on launch day and the company is working with HBO, Netflix and Hulu to build VR apps for the View as well. Google intends to offer a VR version of the Google Play Store, where Daydream users can get access to VR movies, YouTube videos, StreetView, and photos. There are reportedly over 50 partners that have signed on to launch Daydream apps by the end of this year, but it's unclear just what percentage of the content will be games. This is exciting because VR. This is extra exciting because I need a new phone soon anyway! I wonder how enjoyable it would be to watch a movie with this, in theory it could be better than the biggest screen because it will take up your whole field of view. Mobile VR is quite good, but the screen size limit of the phone does become a bit limiting and really over time dampens the excitement. I'm using an Iphone 6 plus. Maybe they've managed to get the screen closer to the eyes with some better focus functionality on this headset, but I see no focus control anywhere obvious. I have a Gear VR 2016 model. I wouldn't be comfortable watching a movie over a long period of time and it does have the resolution issues already mentioned. 360 video is a better use of the technology in my opinion, than 2d cinema. We have seen the popularity of VR move from the expensive PC sector to an interest in Mobile VR - but as we saw with the GearVR and other VR holster systems there are questions on duration of usage, content suitability and the need for better tracking. For me Daydream View feels like too little too late - with no real innovation. The quality of screen, lack of positional tracking and questions on the claims of users actually wearing the unit for long durations of time to view films. All questions that Google seems to be banking on sidestepping, with a well oiled hype machine. It is clear that we are now entering the 'make or break' period of this latest phase of VR - if Sony's PSVR can penetrate the mainstream, then pressure will be placed on Mobile VR to improve its act greatly! Not sure where this sits at this price. Maybe as a try before you buy (like Cardboard) a tethered headset but $80 is expensive for that. Push the boat out a little and you could buy a Samsung Gear. I don't see any reason to buy this Google headset over the much MUCH cheaper chinese headsets, except for the quality of the lenses maybe..
A standardized input method that actually works for a change, is probably the best reason. Another one might be that daydream compatible devices will be held to higher scrutiny. No more 0.2$ gyro boards in phones that "can run Cardboard apps". Not being locked to Samsung phones is the best reason not to buy a Gear. Price wise, compared to any other tethered platform, it's a pittance so it might server as a cheap entry point into VR. That is, if the apps are there.